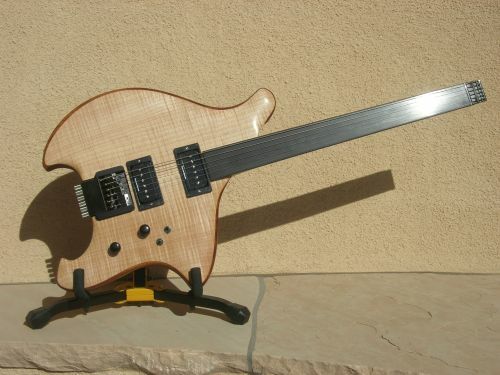 Based on the previously seen Equinox electric guitar, Rick Canton follows up with this fretless guitar version incorporating a number of its own interesting features. The fretless fingerboard is 6063 aluminum, sanded to 1500 grit, polished with Simichrome and then hard anodized in black. A two way truss rod and Steinberger head piece with single ball string adapter complete the neck. The ribbon sapele chambered guitar body is matched up with a curly maple top – a beautiful combination of woods. While you’re looking at the sapele figuring take note of the careful attention given to the heel contour where body and neck come together. Canton also includes another nice little detail by recessing the Straplocks. One of them is visible above the four bolts securing the neck. Finally, a Bondy hardtail headless bridge takes care of things down below with Seymour Duncan P-Rails handling pickup duties. Hi! !Ä° love this guitar!Ä° try in fretless guitars standart single coil stratocaster pickups!And i’ll find with neck pickup oud sounds.With humbucking pickups its most powerfull and sustain is better.Please try Seymour Duncan Alnico II pro neck&bridge pickups.Thank you…. I was surprised to see no mention of a Sustainiac pickup on the fretless Equinox and Mustafa has yet to post any audio or video. Does this guitar have a Sustainiac? I take it that the answer is no. I would love to hear Mustafa play this! Excellent guitar, well done! I love the bamboo neck. What do you think of the aluminum fretboard? Thanks for sharing–brilliant work. hi BurÃ§in, I thought of Alnico IIs, but wanted the flexibility of the P-90 and single coil tones with the Rails. In full humbucker mode, it still has a nice clarity and response, and you can wire each of them out phase to get a more PAF tone. hi Alan, I’ve read about the Sustainiac and know that other fretless players use them, but Ive never had the chance to work with one directly. The guitar as is has reasonable sustain, particularly in the lower 4 strings — *especially* considering it’s so heavily chambered *and* a fretless. Rick may adjust the neck angle a bit and make a few other set up tweaks to help the sustain in the higher end, but I often use the sarod technique of using the left hand nails rather than the fingertips, and I’m able to get long lines with that so far. hi Jerome, I love the aluminum so far — I have the brass alloy on the Vigier fretless and was going to go for something similar, but Rick really thought aluminum would be a better sonic choice, and I’m pleased he talked me in to it (always trust your luthier!) I like the clarity it seems to offer. I’m curious as to how long the hard anodize will hold out. Rick and I did shoot some video the other day at his house — there’s a rough cut at this link: http://www.youtube.com/watch?v=a8YZyFoWM5Y , but before BTEG embeds it, I want to edit it slightly to present a bit more cohesive performance and take off a few errant notes, lol. Thanks to Robert for showcasing Rick’s beautiful instrument, and special thanks to Rick for building it!It really is very special. The source for the compressed bamboo used in the neck is the same as that used in the fretless baritone guitar referenced above – Teragren. Loved the video! Great sound, interesting music. What tuning are you using?? Rick’s work is consistently strong, isn’t it? thanks! the tuning is c-g-c-g-c-f, low to high, which is based off the sarod tuning. yes, to Rick’s work , you’re right! — i m already dreaming up one, possibly two more fretlesses – doubleneck 12/6 and ergo electric sarod…. Hmm, with those low notes, what is the neck scale length? you’re in luck — we had to order a pretty large stock of the bamboo as a minimum order, so Rick has enough on hand for other necks, no problem! Hi Mustafa, I was in contacted with Rick last night about my ideas for a bamboo GL sized guitar. Thanks for the heads up! 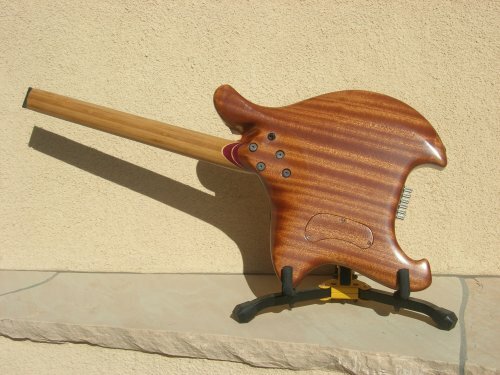 curious — are you thinking of getting the whole guitar out of bamboo?? No problems with the toggle switch placement — but i dont really do any strumming work, its all lines, or sometimes crosspicking arpeggio chords. Nothing in the way so far. If you click on the video link, you’ll get a good idea of hand placement, etc. Thanks Mustafa, I would use a Moses neck like the one on my Mini Gordo (maybe short scale)with the smallest bamboo body I could without performance drop offs. my compliments for thinking and making it. well, we did a lot of research , and metal suppliers recommended the 6063 because it would take the hard anodize process better… 6061 seemed to have a lot of nice characteristics, though. even though i did get a hard anodize, it does seem to scratch more than i would have thought. we’re in the process of doing some neck work, and may think of a new fingerboard, so im open to ideas and processes. oh, one more thing 6063 was also alleged to have a smoother surface finish, but now that we’re working the neck, im looking into alloys and anodizing finishes all over again….